Do We Tell Stories Differently Now? How have advances in technology and audience behaviour changed the way we tell stories, who tells them and how we respond to them. What are the challenges for organisations in adapting to these changes and what does the future hold. Martin started working in digital for Uproar, a games company in Budapest back in 1999. Here he was responsible for the online versions of Family Fortunes and Catchphrase. 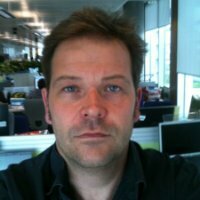 In 2000 he moved over to the BBC and ran the early digital teams for Doctor Who and East Enders as well as helping develop new formats such as Celebdaq which won a BAFTA. He left to help start the educational channel Teachers TV before returning to the BBC in entertainment and comedy commissioning and ultimately as Head of Multiplatform Production. In 2012 he left to be Creative Director at TwoFour Digital and is now at Group Head of Digital at Warner Brothers TV Production UK where he is currently overseeing the Voice amongst other projects . He was named as one of BIMA’s Hot 100 for 2014.